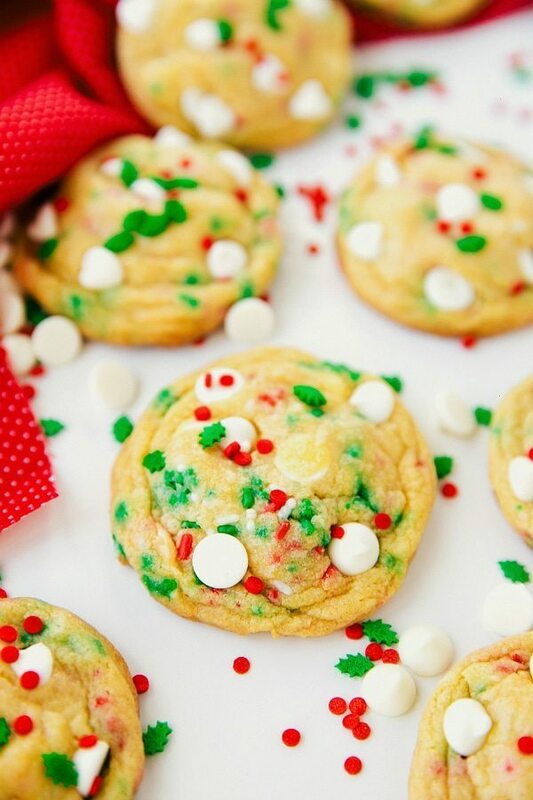 Soft-baked Cake Batter Cookies that are easily decorated up for any holiday (or birthday) celebration! Can you believe that Christmas is only a short 12 days away?! Every single year it seems to go by quicker than the year before and I’m left wishing it would just last a little longer! The best part about this Christmas season for me has been watching Grey start to understand and enjoy it. While he still has no idea who or what “Santa Claus” is, he’s completely mesmerized by the lights we see outside, the Christmas trees everywhere (including ours), and the festive decorations just about any place we go. His favorite thing though? Our elf on the shelf. (That, yes, I made the husband buy me before we had any kids…?) We pulled that little guy out the day after Thanksgiving and explained to Grey that he could not touch it. While I thought the first thing he would do would be either to grab it, take off it’s hat, or try and hug it, he has actually been 100% obedient. He won’t even get near it. ? The husband is the genius behind the elf. He has faithfully hidden it somewhere new every single night. And without a glance at Pinterest or the internet, he has come up with some pretty hilarious places. The first thing Grey does when he wakes up in the morning is says “elf! elf! elf!” And then we go searching all over the house for the hidden elf. One day the elf was sitting in his high chair eating shredded wheat from his breakfast bowl. This actually made Grey cry. He wasn’t ready to share his cereal OR his highchair with this little elf yet. Another day he was on Grey’s miniature potty seat with a blob of nutella left behind. This was in attempts to help Grey see how cool it is to be potty-trained. Something that he thinks is extremely UN-cool for the moment. ?It didn’t work. Sigh. But on the plus side, I found out that elves poop nutella, so I’ll keep him around. ? One day he was hung upside down from the chandelier which made Grey giggle and point him out all day long. One day he was in all of Grey’s toys building towers with his blocks. Grey was super excited to have a play-mate and gladly obliged to teaching him how to build an even higher tower. And another day he was roasting mini marshmallows over our candle. Grey didn’t get it. I’ve also taught Grey about stockings. Every morning he’ll point to each stocking and tell me who’s is who’s. This is right after he flips the switch to turn on the Christmas tree lights. He figured that one out himself. We also are doing chocolate advent calendars and one morning I let him have my chocolate from my calendar. Now, every morning, he eats his chocolate and then looks at me with his cute little boy (puppy?) eyes and I end up giving him mine again. The other morning the husband gave him one and I think he’s going to be having three miniature chocolates every morning until it’s Christmas. Along with the elf on the shelf, the chocolate in the advent calendars, and all the Christmas decorations, these cookies are definitely one of Grey’s top favorite things about Christmas. He would eat ten of these cookies a day if I’d let him! He loves them. He’s also smart enough to know I pretty much always have cookie dough in the fridge. He’ll go to the fridge, open it, and point to the clear bowl that he can see is filled with cookie dough. I believe these are his favorite cookies because of the sprinkles. When he eats one he will repeatedly point to a sprinkle and yell my name over and over again. “Mama, look.” I’ll reply enthusiastically about the sprinkles and then five seconds later, he’ll show me them again. And again, and again. And one more time for good measure. Okay, make that five more times for good measure. These cookies have been made several times already this December and they are always a hit. They are pretty simple to make and full of flavor. They are like a cookie + cake flavor hybrid. The texture is still very much like a cookie — crisp edges, chewy and soft interior. They don’t have a cake-like texture, but do taste like cake batter. You can jazz them up with whatever you like — sprinkles, white chocolate chips, milk/semi-sweet/dark chocolate chips, or even a mixture of all three! The best part about these cookies is the dough does NOT have to be chilled. That said, I still usually do chill the dough because I like the slightly different texture of chilled cookie dough best AND the flavors have a chance to really develop and become richer. Even just thirty minutes in the fridge does great things for these cookies! Hopefully the video helps with the visual aspects of making these cookies so I don’t have a ton of tips, but my number one tip to making these the BEST, is to slightly under-bake them. Under-baking them will leave a super chewy and soft interior. PLUS these cookies do bake a bit more on the baking sheet after removing them from the oven. As soon as the edges start to brown, I generally pull them out and let them sit on the cookie sheet for a few minutes to “finish cooking.” The edges get crisp and the center stays gooey and delicious. ? Preheat the oven to 350 degrees F. Line a baking sheet with parchment paper or a baking liner. Add in the eggs, one at a time, beating after each addition. Beat in the vanilla extract and imitation butter extract. Add in the pudding mix and cake mix. Beat and then scrape down the sides with a spatula. Add in the flour and baking soda. Beat. The mixture gets super thick so you will likely need to mix with a wooden spoon. It is supposed to be very thick. Stir in the sprinkles and chocolate chips. You may need to knead these add-in's a bit with your hands because of how thick the dough is. Form cookie dough balls (see video for shape I roll the balls into) that are about 1.5 ounces in size. Place no more than 9 cookie dough balls per cookie sheet to give ample room for the cookies. Bake for 8-10 minutes or until lightly browned at the edges and still soft (slightly under-baked in the center). Remove from the oven and allow to continue to "cook" on the cookie sheet for another 3-4 minutes. While they are on the cookie sheet I add in a few more chocolate chips and sprinkles just to make them look pretty. This is, of course, optional. If you want to chill the dough (I like it chilled for a slightly different texture and better flavor (ingredients meld and become richer), chill the dough covered for at least 30 minutes to 2 hours). Roll the balls and place on a cookie sheet. With cold dough, these cook for a bit longer -- closer to 12-15 minutes. Every oven is different though so mainly watch for a slight browning at the edges and bottom of the cookies. Ah, these look so cute! We cant stop making cookies over here! These look incredibly delicious and I love your story about elf on the shelf! Our first night introducing ours was a total mommy fail… Chase threw it accross the room crying because it scared him…lol! Hahaha oh no!! Too funny! 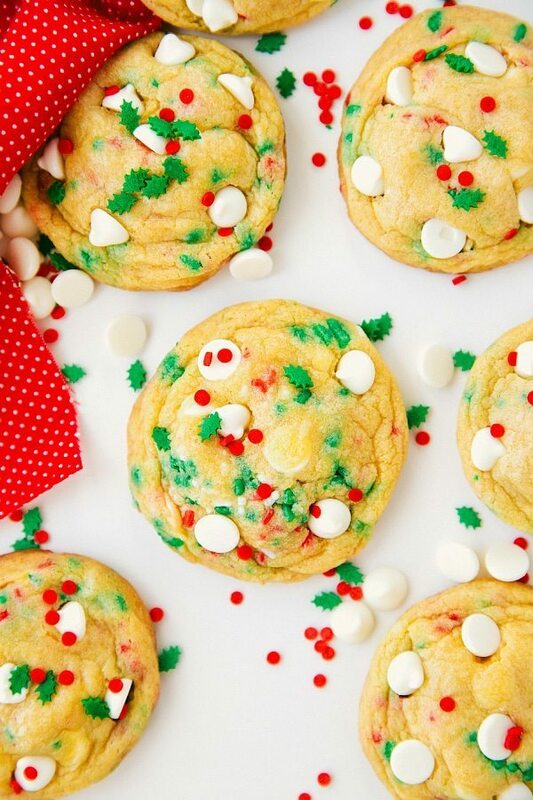 Cake batter cookies are the best. These cookies look super soft and chewy, just the way we like them! With my son grown, I can’t tell you how much I enjoyed reading about your Elf on the Shelf adventures! Nutella, your husband is adorable! And, so are these cookies. Can’t wait to try them. I am drawn to rainbow colored foods! Seriously. I dont know what it is about rainbowwwwwww!! Hah!! They are just so fun! Thanks GiGi! You are so welcome! 🙂 So glad you enjoyed these!